Vancouver's Turn: detail from City of Vancouver policy report (pdf). Formerly the Ritz-Carlton project, this skyscraper is set to become Vancouver's tallest. When you think of Vancouver, Donald Trump probably doesn't spring to mind right away. That's why I'm sure I'm not the only one who spotted a distinct lack of enthusiasm as CTV's anchors discussed the possibility of a Trump-branded high-rise in Vancouver. The brand Trump-Vancouver rumour is pinned on that construction site on West Georgia between Thurlow and Bute. UBC marketing professor Darren Dahl spoke for many a Vancouverite when he said, "When you think of Vancouver, you don't think about Donald Trump in any way, to be honest." The project is called Vancouver's Turn, due to the twisting facade of the proposed 67-story building. The first 20 floors would have been home to a Ritz-Carlton hotel, with the rest as apartments. This is the City of Vancouver's policy report on the project (pdf). The project began in 2005. Ritz-Carlton walked away from the project as luxury sales slackened in 2008, and the whole thing was cancelled in 2009. Now the Holborn Group is looking for a new high-profile partner. This is where Donald Trump (real estate tycoon, reality TV star, birther, and pro wrestling hall of famer) brand comes in. Such a building would need overseas investment from the get-go: no way that sort of support could come from within Vancouver itself. We simply don't make enough money. According to the CTV article, "Under developer Holburn Group, the Arthur Erickson-inspired twisting tower is said to be relaunching as the city’s first Trump tower." Well, who is it, exactly, "said" that Donald Trump is coming to Vancouver? I reached out to Nicole Lim, who handles PR for the Holborn Group. She got right to the point: "Holborn does not have any insight into how this rumour got started." Donald Trump himself does not take unsolicited calls; I found this surprising, since Trump is all about unsolicited speaking. I left an inquiry with the PR firm that handled the Trump's Toronto project, but I don't have high hopes. Just for the heck of it, I reached out to The Donald via Twitter as well, so let's see what happens. 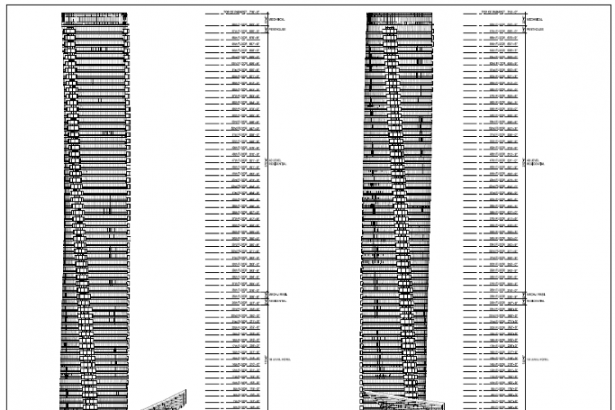 Do we really need a luxury hotel/luxury condo building in the West End? Obviously not: the last thing local families will say is, "Wow, I hope new apartments that command $3,000 monthly mortgage payments get built, and quick!" However, the City of Vancouver collects property tax: the pricier the real estate, the more tax collected. So, in a sense, the city itself is betting against its own locals. It's also worth mentioning that a Donald Trump real estate deal is a hit-or-miss proposition. Many Trump projects have gone sour in a big way: just look at Trump Tower in Toronto. Donald Trump is basically a professional celebrity at this point; would the deep-pocketed "Asian market" buyers care about Trump's name? Not unless they watch lots of reality TV. Before the Ritz-Carlton deal fell apart, the cheapest condo offered in the building was priced at $1.4 million. The penthouse? 28 million bucks. If completed, Vancouver's Turn would become the city's tallest building. As for the site itself, 1133 West Georgia is home to heartbreak after heartbreak, enough to make any detective dog say, "Ruh-roh". Nothing built there since the 1950s has thrived, according to historian John Atkin. In the video linked above, City Councillor Raymond Louie denies that the site is straight-up cursed. That depends on a would-be investor's point of view: how expensive is "too expensive" to get your foot in the door in this city? If offshore investors don't see a lucrative future in Vancouver luxury condos, then the outcome is indeed predetermined. How well do you really know Kitsilano? You recognize this construction site for the Vermeer in Kitsilano, but what used to be here? Do you know West 4th as well as you think?